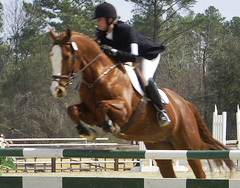 A balanced horse that moves naturally through collection exemplifies a rider’s equitation. Trainers and riders use various bits, aids and tack in order to achieve rideability and smoothness in a performance that shows off a rider’s horsemanship. Regulation snaffles, pelhams and full bridles, all with cavesson nose bands, are allowed. Boots and conservative colored bandages are permitted. A judge at his own discretion can penalize a horse with nonconventional types of bits or nose bands. Given the range of bits, martingales, and equipment allowed in equitation classes, our experts comment on the equipment that detracts from a round and their preferences in tack that enhance an equitation performance.